February 24, 2014… The 2014 season is off to a strong start, with brisk advance ticket sales. 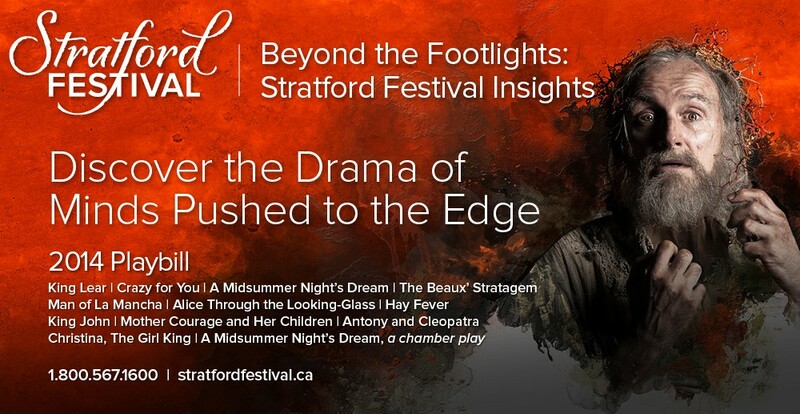 To meet demand, the Stratford Festival is adding performances of Antony and Cleopatra and A Midsummer Night’s Dream: A Chamber Play. “We have presented Antony and Cleopatra just four other times in our history,” says Artistic Director Antoni Cimolino. “Audience members who have been eagerly awaiting a Stratford Festival production of this title will be justly rewarded. We could not hope for two more passionate and charismatic actors to play the title roles than Geraint Wyn Davies and Yanna McIntosh. In this production of A Midsummer Night’s Dream four actors – Sarah Afful, Dion Johnstone, Trish Lindström and Mike Nadajewski – will explore the multiple worlds of Shakespeare’s play. It will reflect on Shakespeare’s intertwining of pagan and Christian spirituality and venture into the inner realms of the play’s supernatural elements. The Festival has confirmed that A Midsummer Night’s Dream: A Chamber Play will be staged in Stratford’s Masonic Concert Hall, located downtown, at 15 Church Street, across from the library and court house. The idea of presenting the show in a non-traditional venue was central to the vision of director Peter Sellars. He feels that the venue’s location in a combined commercial-residential neighbourhood makes it a perfect choice and he is delighted that the Masons are enthusiastic about making improvements to the building for its future use. Friday, August 1, at 2 p.m.
Friday, August 8, at 8 p.m.
Thursday, August 14, at 8 p.m.
Friday, August 22, at 8 p.m.
Thursday, August 28, at 8 p.m.
Thursday, September 11, at 8 p.m.
Friday, September 19, at 2 p.m.
Friday, August 29, at 2 p.m.
Friday, September 5, at 8 p.m.
Saturday, September 13, at 8 p.m.
Tickets for these additional performances will go on sale to the public at 9 a.m. on February 26, with advance sales to Members of the Stratford Festival beginning at the same time on February 25. 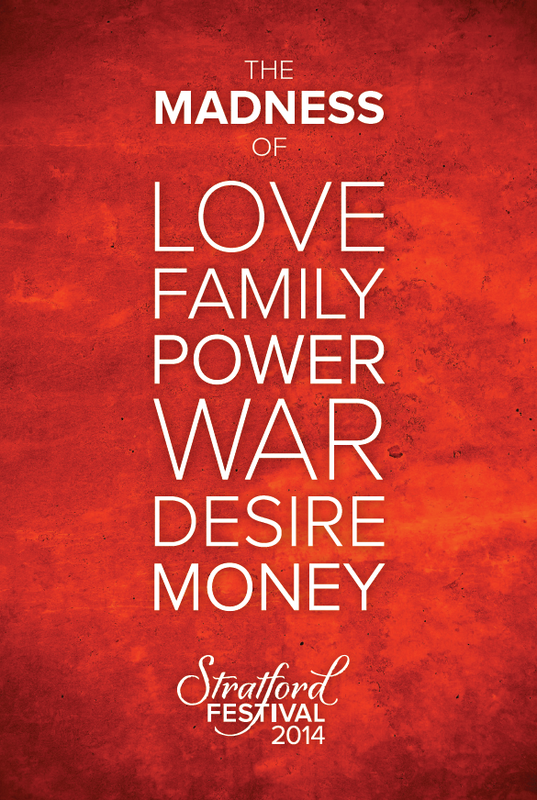 Call the box office at 1.800.567.1600 or visit www.stratfordfestival.ca to purchase. A Midsummer Night’s Dream: A Chamber Play is sponsored by BMO Financial Group. Production support for Antony and Cleopatra is generously provided by M.E.H. Foundation. Support for the 2014 season of the Tom Patterson Theatre is generously provided by Richard Rooney & Laura Dinner. 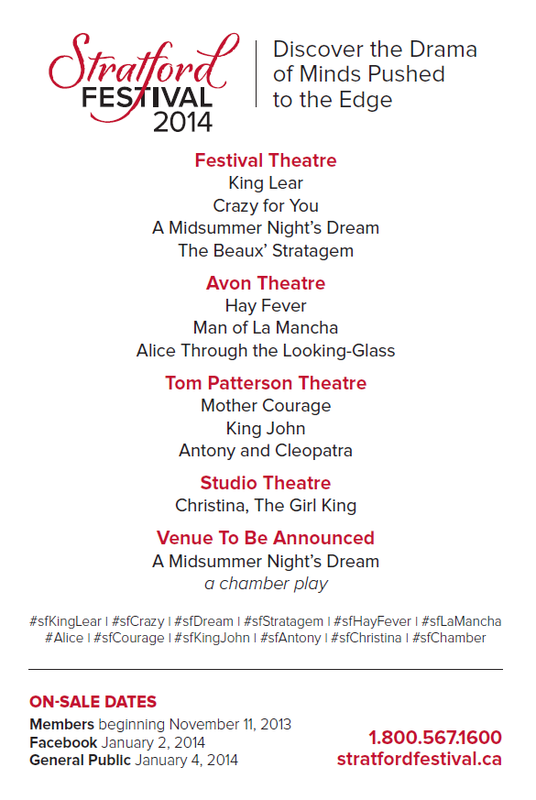 The 2014 season of the Stratford Festival runs from April 21 to October 12, featuring King Lear; Crazy for You; A Midsummer Night’s Dream; The Beaux’ Stratagem; Man of La Mancha; Alice Through the Looking-Glass; Hay Fever; King John; Mother Courage and Her Children; Antony and Cleopatra; Christina, The Girl King; A Midsummer Night’s Dream: A Chamber Play; and more than 150 events in the Stratford Festival Forum.